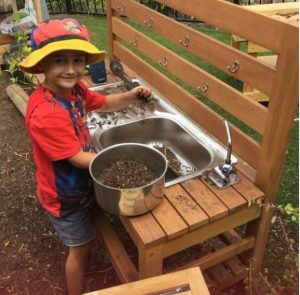 This week at Bambinos Kindergarten Horningsea park, we saw the introduction of our mud kitchen into our sustainable garden environment. What an incredible experience this has been! We have seen mud cakes, dinner parties and lots of exploration and creative play occurring across all ages. Scientists have discovered something that children have always known – playing in the mud can lift your mood. Recent studies have revealed that dirt contains microscopic bacteria called Mycobacterium vaccae. This increases the levels of serotonin in our brains, helping us to relax and keep calm. Many children today never know the outdoors beyond the school playground or their own backyards, if they even have one. Getting children outside to play (as a place to act out make believe worlds and explore) creates happy memories with the one most primal elements in our world: nature. Research has shown that playing in the dirt – including very wet dirt – is good for a child’s immune system. Sensory, hands-on play feeds children’s brains. Using mud along with other naturally available resources like twigs and leaves, encourages children to explore their creative and imaginative side. Having an area outdoors set aside for mud play (such as a mud patch or a mud pie kitchen for example) provides a space for children to retreat. They can choose to relax alone or play with their peers in a soothing sensory experience. Mud can be moulded and decorated. Its versatile nature enables it to responds differently from sand, clay or play dough. There are so many ways to use mud for art, here are just a few. Mud is an open-ended material that meets the different needs and interests of different children. A younger child might be right into the sensory experience while older preschoolers are busy making their own mud bricks. With mud, there is something for everyone. Think back to your own childhood. Do you have happy memories of playing outside in the mud and the dirt?